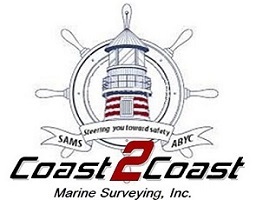 Coast2Coast Marine Surveying, Inc. provides Level 1 Certified Thermal Imaging expertise. All our Marine Surveys incorporate Infrared imaging as part of the service. This technology provides the capability to reveal incredible and potentially vital information about any marine vessels structure, electrical or mechanical system. We utilize Infrared (IR) technology to assess the integrity of the vessels hull and deck structures. We look for fiberglass delamination, deck and hull moisture, electrical hot spots and full engine and drive train thermal analysis. This service is included in all of our pre-purchase surveys. The image set on the 1st slide shows consistent temperature on the deck which would indicate a dry core. The image set on the 2nd slide shows obvious temperature differences due to elevated levels of moisture (blue areas). 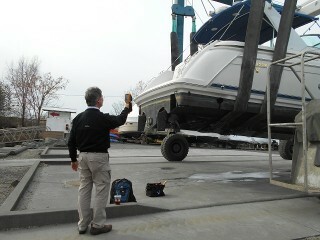 A Tramex Skipper Plus moisture meter also revealed high levels of moisture in this area as well. There was deep crazing in this area and the unsealed hardware (stanchion, cleat) are contributing to the moisture ingress. On the 3rd slide is an example of a hull section during the haul out. An Infrared Thermal inspection of the electrical system is very useful in identifying potential trouble before it becomes a serious safety hazard. In the harsh elements of the marine environment, the electrical system is exposed to extreme temperature changes, damp conditions and constant vibration while under way. The image to the right shows a bad circuit breaker in the main distribution panel. The two (red) conductors connected to the faulty breaker are above 140º(F) and in danger of catching fire. 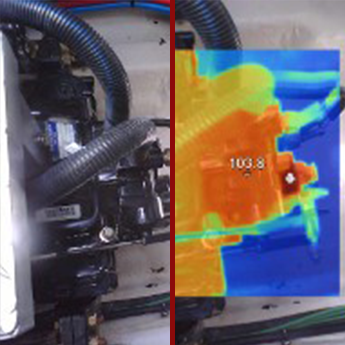 Infrared Thermal inspection of the engine(s), gearboxes, gensets, fresh, and raw water cooling systems should all be inspected for possible trouble unseen by the naked eye. Even though temperature gauges might show normal temperatures, there could be a blockage or leak developing in the system.